The whimsical, yet effortlessly cool Sunny Sports is back for Spring Summer 2013 with a number of items to look and feel good in while you get into a deep lounge this summer. Shawl Deck Jacket. Blending traditional Japanese Sashiko-style stitching with Western heritage design the shawl deck jacket is the essential summer coat. Made from a light weight indigo chambray this piece has all the functionality of a hard working chore coat, with the finesse and tailoring of a classic fitted blazer. Four Pocket Vest. Made from the same material as the Shawl Deck Jacket this vest fits close to the body to be easily paired with your favorite collared shirt and sports coat. Notable details include marbleized quick-release buttons (available in black or white), circular tacks at points of pocket stress, and distressed sizing label. Bandanas Shirt. 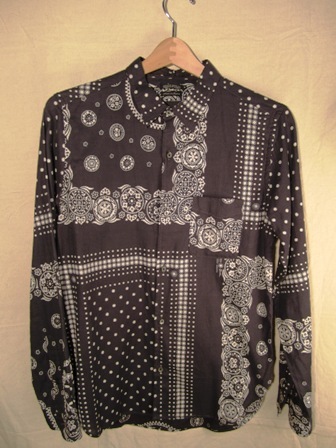 Printed with two of Sunny's most popular bandana patterns this beautiful button-up shirt is made with a very lightweight cotton herringbone in a deep grey/indigo color. Printed using a heritage-inspired discharge process each shirt varies slightly depending on how the print lines up in different areas of the shirt. 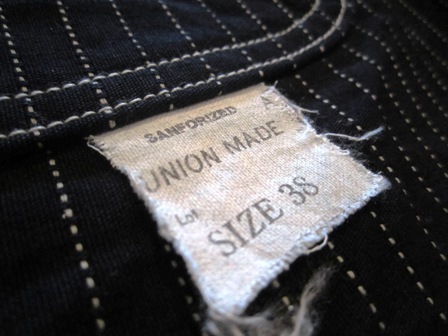 This style runs narrow, we recommend sizing up 1-2 sizes depending on preferred fit. Sunny Sports vintage style 40's C.P.O shirts are made by Japanese artisans using fabrics and construction methods staying true to the originals of 1940's America. 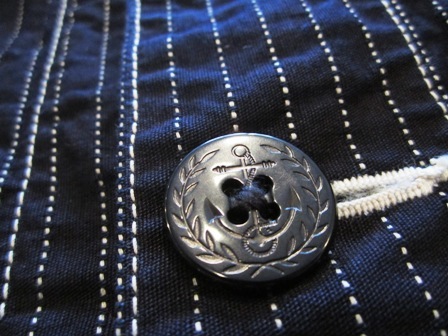 Check out the navy anchor buttons.